The big and small screens can have a powerful impact on a variety of other cultural aspects, from fashion and music to even trends in food. Interior design often takes inspiration from popular films or television programmes, nowhere more so than the current fashion for period style. 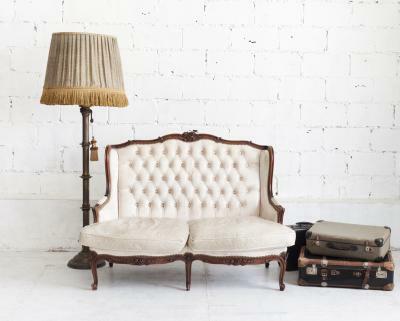 TV drama Downton Abbey has spawned an array of spin-off merchandise, from jewellery to wine but if you really want to give your life a Downton-style makeover, try incorporating some of the fabulous interior design ideas into your home. The imposing Highclere Castle doubles up as fictional Downton Abbey, but even if you don’t happen to own a country estate you can still add a little Downton atmosphere to your home. This type of design is formal and quite grand so works best in rooms that are not too small. A living room or dining room would be perfect, but a sumptuous bedroom or even a decadent bathroom can also easily be given the Downton treatment. The ideal space would have high ceilings and a dramatic focal point such as a fireplace or chimney breast. However, if you don’t have these it is easy to add period-style detail by installing moulded coving and an ornate ceiling rose around your light fitting. The essence of Downton style is richness, elegance and glamour. The post-war period saw the overlap of the grandiose Georgian, sumptuous Edwardian and innovative art deco movements, resulting in some truly fantastic interiors ideas. Strong colours such as deep blues or rich reds look bold and glamorous but if they are too dark for the room, pale creams, golds and mint greens are fresh, pretty and luxurious. Striped, floral or damask pattern on wallpaper and upholstery add a feeling of opulence. Using rich fabrics such as velvet and silk brings texture to the decor and create tactile appeal. One of the most characteristic elements of Downton style is the stunning furniture. Sumptuous button back sofas, available from companies such as www.thomaslloyd.com make comfortable yet stylish additions to a living room, particularly when accompanied by ornate occasional tables. Delicately-carved dining chairs are perfect for elegant and sophisticated entertaining while a richly-upholstered chaise longue brings a touch of decadence to a bedroom or lounge. Even if you aren’t lucky enough to have your very own library, adding in plenty of bookcases in dark wood will complete the look. The finishing touches are what really transform the room into something special. Lavish accessories will give your room glamour and sophistication so opt for an eye-catching chandelier and matching wall lights. Include plenty of mirrors – not only will they make the space feel bigger but choosing ones with gilt frames will enhance the feeling of opulence in the room. Add plenty of cushions and rugs for additional texture and interest. Finish with clusters of candles in an ornate candelabra and a couple of carriage clocks on the mantelpiece for that authentic look. If you are looking for timeless elegance and sophisticated style, a Downton-inspired interior is the perfect design solution.